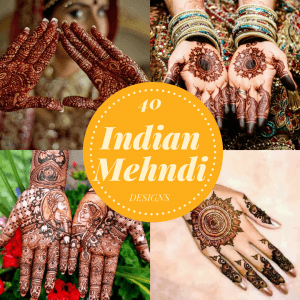 Best Indian Mehndi Designs – Mehndi or “Henna” is a form of body art based on dyes prepared from the plant called Lawsonia inermis. It is an immensely famous and widely used technique for adorning the body. It’s used especially on the palms, during festive occasions by the women of different cultures, mainly belonging to the Middle East and South Asia but fast gaining popularity among the Western women as well. Mehndi is heavily applied during wedding celebrations and the idea is deeply ingrained in the Indian culture. It is customary to adorn the hands, feet and sometimes even shoulders or other body parts of the bride. Apart from that, Eid, Divali and Karva Chauth are some of the celebrated occasions in India where it is happily put on. It is a belief among the people of India that the darker a bride’s henna is, the more strongly she will be loved my her husband. Whether you condone or laugh at such superstition, it is true that darker shade of mehndi is more beautiful and pleasing to look at. Various methods are thus administered to make the mehndi blacker or redder. During the time the paste is drying and beginning to crack, apply a mixture of lemon juice and white sugar. This re-moistens the henna mud. Heat, body or otherwise, can also cause the color to darken. To achieve that, simply wrap up the decorated area with something to trap the heat like tissue paper or something equally lighter. Or hold out your hands near some form of heat. If henna is implemented on thick skin, it’ll have a darker color when washed off as compared to thin skin. A strategic application will help. Make sure not to exfoliate your skin while your hands, et cetera are adorned with henna. It’ll cause the color to fade quickly. Natural oils also help preserve the color of the stain. There is no true method to make the mehndi stain redder. It’s a combination of the person’s skin, the quality of the henna, where it is applied (namely the palms) and the duration after it is taken off. The early stains tend to be much redder than the later ones which become darker with the passage of time. While the invention of new, innovative and refined techniques have improved the quality of henna, so has the henna business thrived with a number of women running successful businesses offering their services online. It is generally considered to be a socially acceptable form of employment where the idea of women working is frowned upon. Indian designs tend to be more organic and flowy, curvy. There are a lot of paisleys and flowers and peacocks. There’s a subset of Indian henna designs called the Arabic and these usually tend to be asymmetrical with a lot of open space and a mixture of thick and thin lines. This design is such a graceful mix of flowers, leafy swirls and curves, elegantly balanced with some free space that doesn’t make it look too crowded. It’s also incredibly intricate. This type of designs are fast becoming popular among the brides and for good reason! Who wouldn’t want a picture of the happy couple on their palms! It symbolizes the beauty and joy of their union. It’s one of the traditional designs brides and artists alike go for. The hands and feet are covered with such intricate and delicately put framework of flowers, leaves and patterns that there is hardly any space left. And it looks absolutely stunning. Best part? Any specific henna design can be adapted into this style. It’s an emerging trend and wondrous to behold. One important fact to be kept in mind, though: White Henna isn’t actually henna. GASP, right?! It’s actually an adhesive that can be sealed inside a cone and has been used recently for body art. Flowers in general and roses in particular are the most commonly used motifs adapted into almost every henna design. They’re beautiful, they can be simple, they can be detailed and this particular one is delightful. The roses and leaves are so strikingly intertwined, you cannot take your eyes off the design. This one’s truly ingenious. Not many people would go for it, not many people will see the point, but you have to admit, it’s abso-foot-ly cool! This has millions of variations and is one of the most applied mehndi techniques. It looks equally good on both the inside and outside of the palm. This is just one of those designs. Hearts are also almost universally loved as Mehndi designs. But they are usually achieved in halves on both hands, gives a nice, wholesome effect. Designs such as these focus not on the palm but away from it and you have to appreciate how fabulously they adorn the wrists, giving the effect of wearing bracelets or bangles. Perfect for a look when you don’t want too much jewellery on you. A brand new idea to go with your Halloween costume, eh? It’s suitably spooky and edgy. This relatively simple, small and easy-to-do design is strangely hypnotic. It’s a mixture of straight lines and and blocks and it looks effortless. You’ll find countless designs that effectively make use of swirls and curves to create a chic look that is both flawlessly simple and stylish. Okay, admittedly, this may not be everyone’s cuppa tea. Certainly not the blushing bride about to say her vows! But henna is an art and art has innumerable forms. You don’t necessarily have to go to a wedding to get henna-fied, yeah? This is a perfectly acceptable sort of messing around you can do at funky parties, especially those of us with inclinations on the “punk” side of things. Plus, not everyone likes the idea of tattoos, so here’s an alternative! This is an actual doodle sketched by a henna artist. You can see all the traditional elements of Indian mehndi encased within this quirky doodle. You’d either have to be eccentric or stark raving mad to try to achieve something like this! Geometric patterns are painfully precise and hard. A big round of applause for the mehndi artists! This fully explains henna being a “body art”. It’s not for everyone since for something like this you’d have to expose a whole lot of skin, both during application and afterwards if you want it to show. Daring designs like these can go anywhere if one is willing, bare shoulders, back, neck, shaved heads even pregnant bellies! Yeesh. This technique is also applied with “white henna” to make it shine gold or silver. Simple really, you throw some glitter on your henna while it’s still wet and sticky. It’ll look awesome if you don’t intend to wash it off, the stains will not have glitter unfortunately. Unlike white henna which doesn’t leave stains so the glitter will stay up as long as your design does. Such amazing designs give the realistic and jaw-droppping impression of wearing sheer, mesh gloves. And they are absolutely fantastic! Sigh. Want to feel like light and chic? Like you could walk on air and take flight whenever you’d like? Here’s a design to complete the illusion. Suggested with some light-colored dress like lime, pink, or baby blue for a full princess look. Such designs are both intricate and clever. They are strategically placed on the palms and wrists with leaving just enough space to give the impression of wearing rings and bracelets and they look gorgeous. It’s the perfect look for the bride-to-be! Amazing what a bunch of lines can do, eh? This design perfectly mixes florals, mesh and simple lines with varying thickness to create this splendid result. Peacocks are beautiful creatures and their beauty has been translated into mehndi designs for ages. You have to appreciate the cleverness here. This is a look befitting a female Disney villain. But would look equally good if you just happen to not be one. Simple, elegant, yet intricate in its own way. This small design is a must when you don’t want to over-do. After Mughal Feet, presenting, Mughal Fingers! This is an emerging trend among henna lovers, to leave the rest of the hand space free and target only specific areas, in this case, the fingers. Specifically intended to imitate rings. The free space enforces the idea and you can’t help but admire the simplicity. This is the fine work of a true artist. It’s aesthetically pleasing as well as creative. The moon and the rose together imply a deeper meaning behind the design. A broader version of the mesh design, if you will. It’s way bigger and thicker but gives almost the same vibes. Nothing makes a mehndi design more attractive or bold than full finger tips. It’s a go-to technique for brides-to-be. A dizzying mixture of thick and thin lines that is both funky and dashing. This one looks like a clock with all of its hands outwards. Similar designs might also imitate turning gears by drawing semi-circles around each other and making the design look intricate by the use of thick and thin lines. If you like, you can get coordinating patterns on both your hands and feet. This is more of a heavy look, suited for brides. But no one’s holding you back if you aren’t one! Mimicking the way tattoos look is also a relatively new trend and it is undoubtedly, one of the coolest ideas ever! Adds a Mughal/Royal touch and is timelessly elegant, not to mention straight-forward. You don’t need to go through the hassle of hiring a mehndi artist to achieve something like this! The best thing about it is that it’s easy. Not only that, it encompasses a lot of space! What’s better than one design? ALL of them! This particular pattern and others similar to it ensure that you get the entire package if you’re the sort who can’t decide between designs. You have the filling, the floral motifs, leaves, the mesh and simple lines all there. Incredibly detailed and strategic in its placement, it goes beyond the designs that cover only wrists or those who imitate gloves. The best of them all! The classiest, the oldest and probably the most traditional form of mehndi design is the mango motif. Here it is done to perfection and the symmetry is awe-inspiring. You’ve probably heard the term “naam ki mehndi” in a plethora of Bollywood movies and songs. Well, this is where it gets literal. Like mehndi figure work, you can literally customize anything you want and get it written on your hands, feet, wherever you want. Innovative, crazy, but also very cool. So here are the 40 most inspiring designs, the latest trends that have taken the henna world by storm. What are you waiting for? Get those cones of yours ready and start a mehndi-fest right now!